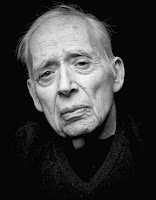 I've been looking into Harold Bloom's famous lit-crit book, The Anxiety of Influence, in which he presents his view that strong poets write in response to powerful poets before them out of an anxiety of influence that drives the latter poets to test their poetic strengths against such powerful poets of the past and thereby reveal their own poetic strengths through creative reinterpretations surpassing those of the earlier poets. I think that this describes Archibald MacLeish in his attempts to wrestle with John Milton, whom he, of course, cannot best. Or so I hope to show . . .
How does one determine who bests whom when it comes to something as subjective as literature—especially poetry? To be clear, I'm not asking in a snide or flippant way: I'm honestly curious. Good question. In some way - subjective, of course - we know that Milton's epic bested a few earlier epics (and not only in English) by alluding to them, using them, and even 'correcting' them, often simultaneously. Milton is taking on Homer, Dante, Ariosto, Spenser, and more. I won't try to prove these assertions, because I don't have the learning to do so, but I think I can show that MacLeish tested himself against Milton, but failed.